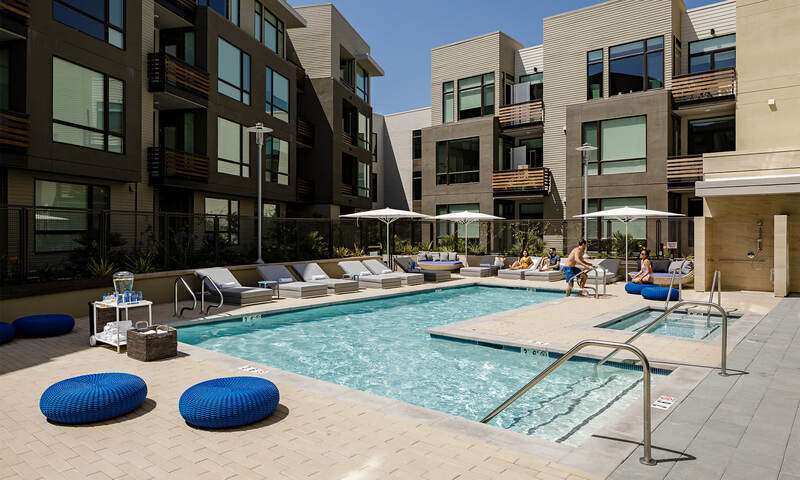 Just steps away from lively Castro Street in downtown Mountain View, 100 Moffett Apartments is the embodiment of “California Cool”. The design celebrates California’s culture, history and scenic landscapes – from the hand placed mountain mosaic in our Neighbor Lounge, to our outdoor barbecues and private balconies. 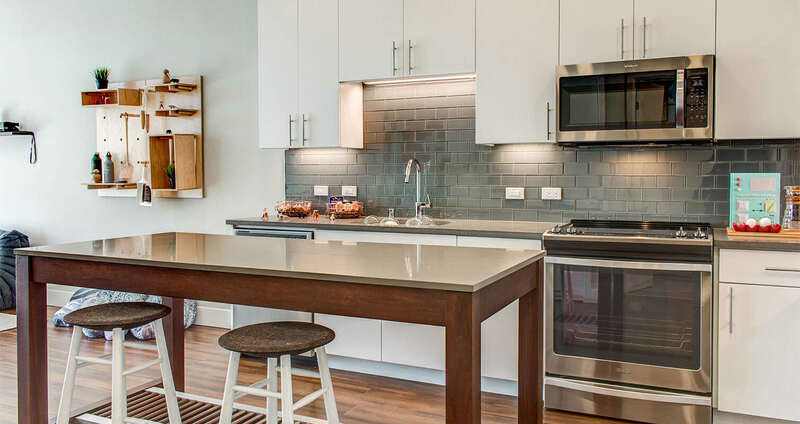 100 Moffett is your vacation at home. Catch some rays on our rooftop deck with stunning views, or take a dip in our saltwater pool. Challenge yourself at the fitness center with tech-driven cardio and advanced strength training. When you’re seeking some solitude, retire to the comfort of your home. Each element is augmented with luxury conveniences, like spacious double-pane windows for lots of natural light, ten-foot ceilings for an expansive atmosphere, and emergent tech amenities like 24/7 individual package lockers, smartphone-driven keyless entry and eco-friendly NEST™ thermostats. With a Walk Score of 88, you’ll find the latest in nightlife right at your doorstep. Sample comfort food from Scratch, indulge in tapas over at Cascal, or discover emerging talent at the Mountain View Center for the Performing Arts. When it’s time for your commute, save some time with instant access to the 101 and 85 freeways, the 51 VTA line, the light rail, and downtown Mountain View. Balanced architecture, individualized spaces and a tranquil atmosphere – all pieces of a unique take on apartment living. 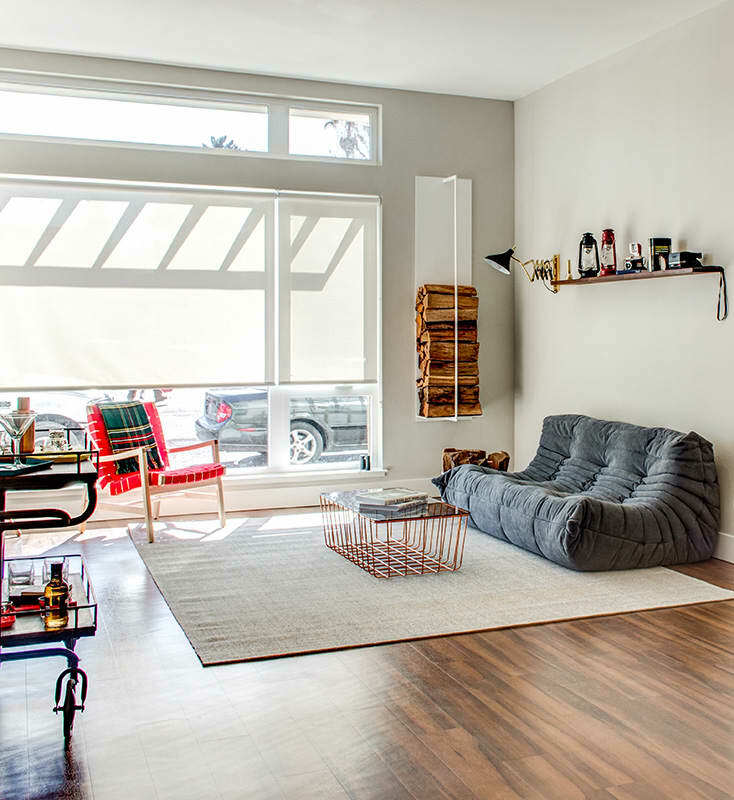 100 Moffett is a creative grounding to call your own. We speak woof, meow, blub-blub and tweet. View our pet policy. We champion an all-inclusive*, Friends With Paws Program. No more weight limits, height restrictions or “Best in Show” hoops and hurdles. We’ll greet your four-legged confidante as a distinguished guest with a Welcome Kit that includes tasty treats and toys to help your pal feel right at home. Our team can even help the two of you find suitable pet grooming and daycare services when you need them. *For the pooches breed restrictions do apply. Three-pet maximum per home. Additional fees and deposit required. All pets are subject to compatibility screening. Multi-purpose clubhouse lounge with free Wifi. A friendly game of Marco Polo never did anybody wrong. Challenge yourself with tech-driven cardio & advanced strength training. Some amenities available in select homes.